Plant sweetcorn in individual pods, 2 seeds in each to aid germination. Sweet and succulent early harvest carrots. Once at this stage they're ready for thinning and bringing-on. 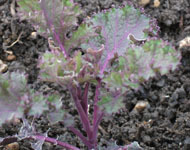 Once seedlings are large enough to fend for themselves plant outside. Don’t Plant all your seed packs at once. All your crops will come at once and even the largest of families would struggle to get through the lot!!!! Wait about 2-3 weeks then plant the other ½ of the packs. 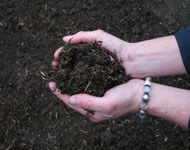 General purpose compost is too course and heavy for planting seeds. The seeds will struggle to peep out through this dense compost. Use a long cane, by gently patting the cane down on the ground sets a good straight row for sowing your seeds. Sow your seed directly in a length of guttering, cover with a pollytunnel (though if you are short on space or want to save a little extra money on buying a pollytunnel for this just cover with cling film, it does the same job. The idea of covering is to retain the moisture in the soil and keep the seeds warm thus speeding up the germination period. Once the seedlings are about 3 -5cm high, dig a trench in your bay the same length as the guttering. 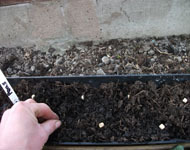 Then place one end of guttering at the far end of the trench, gently tap the guttering to release the compost and seeds, lowering them into the dug trench. Back fill and pat down to bed them in. This saves so much time and hassle pricking out and replanting. This process can be done for French Beans, Runners, Sweet Peas, Sweetcorn, etc. 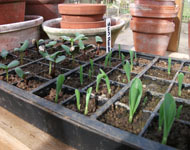 Plant seeds in groups of 2 – prefer to plant in single pods set in single trays. By planting 2 seeds in one pot will aid germination, producing sturdy seedling. Everyone has their own way of “bringing on their runners” I still prefer setting them around moist polly roll, in jam jar I then keep them on my Kitchen window sill, this means I can keep them continuously moist. It also takes me back to my days at Nursery, when we all became “Jack & the Bean Stalk” growers. If you have a greenhouse and anticipate planting cucumber in it don’t forget to get the “All Female” specimens. This will enable immediate germination – It will save you time having to pollinate them yourself. Pumpkins, Corgettes etc. – Do the same for these as well. Tomatoes – The dreaded Black fly can attach, plant Taggets around the base. (these are part of the marigold family and the Black fly don’t like their sent. Double whammie, pest free and extra colour. 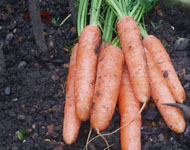 Carrots – Herbs can not only look and smell fab in your plot but can be beneficial to Pest & Disease. 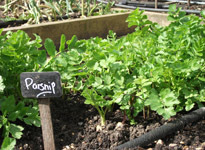 The dreaded root fly can sometimes be kept at bay by planting Chervil next to the carrot rows. Root fly can mean a disastrous carrot crop. The fly eats at the carrot, leaving it inedible!!! I suffered myself until last year........ unti I discovered that the little blighters can only fly 10cm high. So I put plastic edging either side of my carrot rows, followed by fleecing set over semi circular metal stays. The fleecing means that it can stay covered all summer, as water penetrates the fleece and “voila” beautiful carrots! This can be quite fiddly, so I use the pointed end of the plastic label, it gets right under the roots, bending slightly to avoid breaking the seedling. 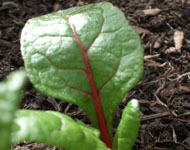 For up-to-date, seasonal hints and tips on how to keep your vegetable plot looking its best - follow us on Twitter!